574 ⊙/ / Netherlands - 1852 / 1985, extensive used collection from the classic formed in a large stockbook, with many older issues, gulden values, special- and commemorative sets, mainly used collected. Very high catalog value! 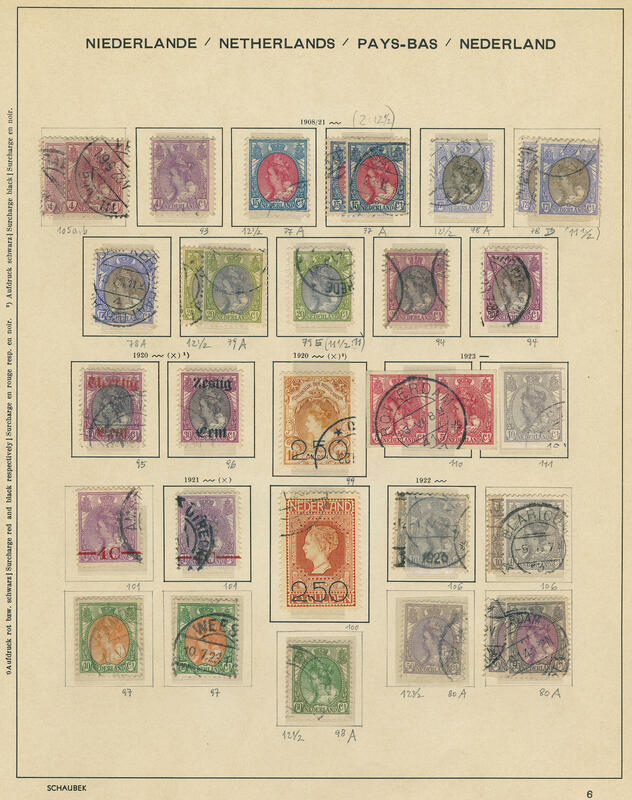 717 x Netherlands - extensive inventory packed in a carton with a lot of material, as well issues Netherlands and colonies with numerous stamp issues, with also souvenir sheets, nice motives, special- and commemorative issues, as well numerous covers, First Day Cover and so on. Extensive treasure trove! 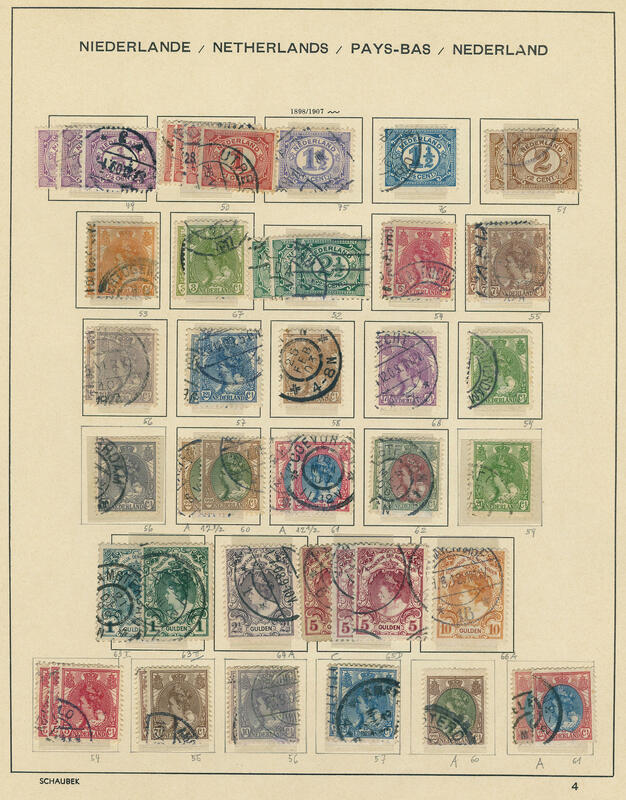 718 x Netherlands - extensive inventory packed in a carton, as well stamp issues, covers and First Day Cover with many beautiful documents, decorative frankings, as well also mint never hinged issues and so on. Treasure trove! 719 x Netherlands / colonies - extensive inventory packed in a carton, with also a great many mint never hinged issues, nice illustrated First Day Cover, lovely motives, special- and commemorative issues and so on. A rich treasure trove! 720 x Netherlands / colonies - extensive lot packed in a carton, as well numerous mint never hinged issues, including stamp booklet, beautiful subjects, souvenir sheets and numerous covers. Extensive treasure trove! 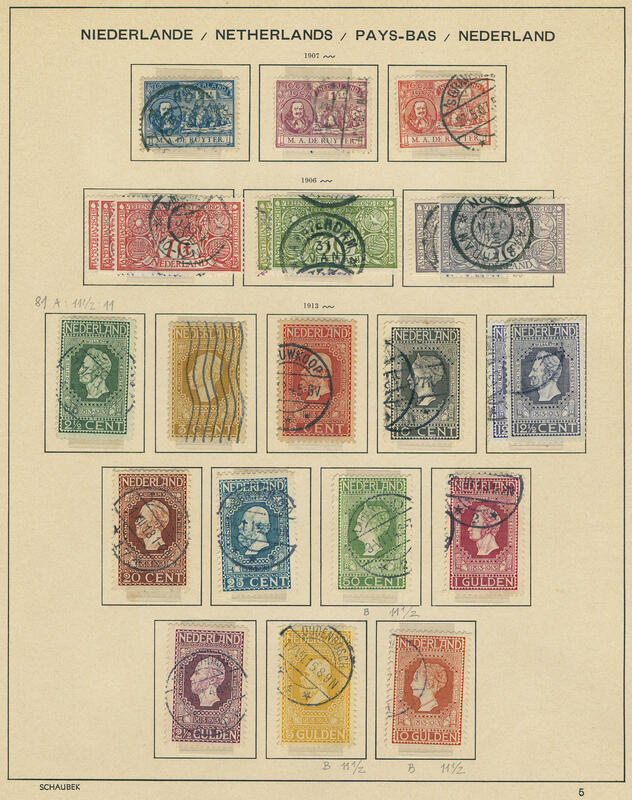 722 x Netherlands / colonies - extensive inventory packed in a carton with a lot of material, as well numerous issues in stock books, mounted on pages and so on. Including many special- and commemorative values, beautiful subjects and so on. Extensive treasure trove! 727 x Netherlands / colonies - extensive lot packed in a carton, as well numerous mint never hinged issues, nice covers, stamp booklet and so on. Including lovely subjects, up to the euro time. Very high purchase price! 728 Netherlands / stamp booklet - extensive mint never hinged collection from stamp booklet from the sixties years in the Davo-Album formed with numerous different issues. High acquisition price! 729 ✉ Netherlands / colonies - extensive lot of covers, cards and postal stationery in a large thick stockbook accommodated. Thereby many interesting documents, nice frankings, older material, airmail, registered and so on. 730 FDC Netherlands - extensive lot of First Day Cover in the box, all in two albums in a cigars box accommodated. As well numerous special- and commemorative issues from 1951, nice motives and so on. Very large number of pieces! 733 x Netherlands / colonies - extensive lot packed in a carton, as well older issues, numerous mint never hinged values, nice motives, stamp booklet, special- and commemorative issues and so on. In bags, stock books and so on. Treasure trove! 899 ✉ Netherlands - interesting inventory from covers and cards packed in a carton. As well nice documents, interesting frankings, much older material and so on. Treasure trove! 900 Kart⊙n Netherlands - extensive inventory packed in a carton. As well numerous issues on stock cards, album pages and so on. Including older material, souvenir sheets and so on. Extensive treasure trove! 1161 /⊙/ Netherlands - 1852 / 1994, rich collection in a large stockbook accommodated with additional still various duplicates. 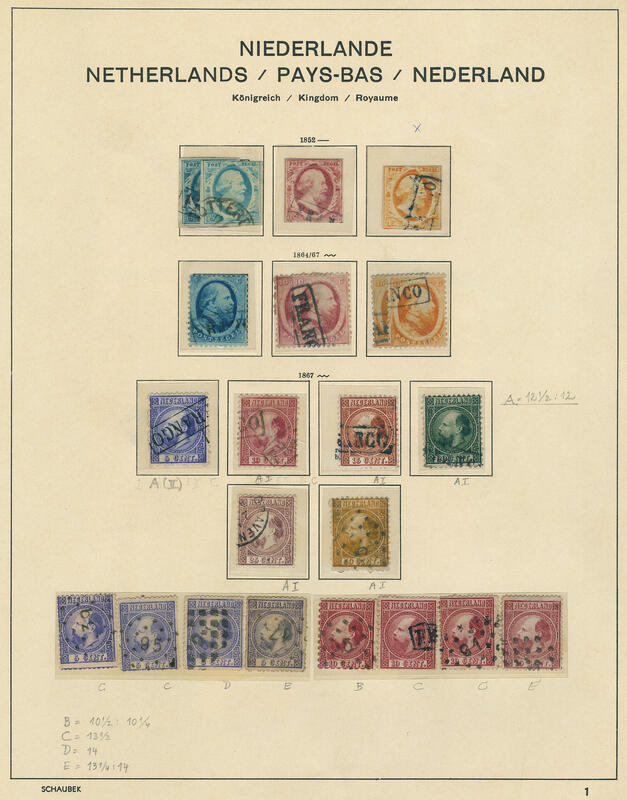 With numerous older issues from the classic, special- and commemorative values, olympic games 1928, childrenÂ´s help, summer stamps series and so on. Lots of material with enormous catalogue value! 1385 /⊙/ Netherlands - 1852 / 1990, very extensive collection in the thick Schaubek hingeless illustrated album, in the number of a major listing more then complete formed. With also all early issues, gulden values including both values 10 Guilder orange, summer stamps sets, childrenÂ´s help, furthermore also perforation variants including roll perforation abundant, all souvenir sheets including Legion block couple, gulls set 1951, also numerous stamp booklet, very good part postage due stamps, official stamps and so on. A magnificent object with substance! 1440 /⊙ Netherlands - 1933 / 2005, rich collection in two safe ring binder formed, as well numerous special- and commemorative sets, nice motives and so on. Very high catalog value! 1453 / Netherlands - extensive mainly mint never hinged collection in the KABE spring back binder, as well issues from the fifty and sixties years, including Rembrandt set, Europe 1956, special- and commemorative sets, complete volumes, as well also Netherlands Antilles and Surinam. Favorable! 1671 /⊙ Netherlands - 1872 / 1969, rich collection in the spring back binder on KABE pages. As well numerous various issues, complete sets, special- and commemorative sets, childrenÂ´s help sets, olympic games 1928, sommer stamps sets, souvenir sheets and so on. Favorable! 1672 Netherlands - 1970 / 2010, complete mint never hinged collection with all issued stamps and souvenir sheets in two KABE albums. With also many nice motives, postal valid issues and so on. A magnificent object! 1814 ✉ Netherlands - 1967 / 93, extensive lot of 500 maximum cards with many beautiful copies, as well numerous different issues in two ring binder accommodated. Included are also numerous nice motives. Enormously acquisition price!